Although it has been over five years since the 9/11 attacks, Americans still do not have a clear sense of how our government is waging the war on terror. 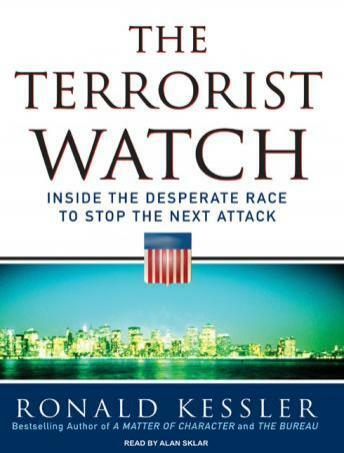 In The Terrorist Watch, bestselling author Ronald Kessler takes listeners behind the scenes to reveal exactly how our leaders, charged with protecting the American people, are stopping terrorists. In his New York Times bestsellers A Matter of Character: Inside the White House of George W. Bush and Laura Bush: An Intimate Portrait of the First Lady, Kessler gained unprecedented access to the Bush administration. Now he has combined that access with the extraordinary network of contacts he has developed in the intelligence community to provide a headline-making, myth-busting insider account of how the U.S. intelligence agencies-under the leadership of the Bush administration-have completely reinvented themselves to thwart terrorist activity wherever it occurs. Never before has a reporter gained such entry to the FBI, the National Counterterrorism Center, and the other agencies that are doing the real, unheralded work in spotting and capturing terrorists. By bringing listeners inside the key war rooms of the war on terror-from the Oval Office to the Pentagon, and from the CIA to the National Security Agency-Kessler destroys the common myths about our government's handling of the terrorist threat. Filled with news breaks, The Terrorist Watch will take listeners up to the minute by focusing not simply on the immediate aftermath of 9/11 but also on the more recent breakthroughs and successes, such as the thwarting of the 2006 London terrorist plot, as well as the discovery and breakup of terrorist cells in Canada. In The Terrorist Watch, the full story is told for the first time.